Download State Corporate Income Tax Rates and Brackets for 2015 (Excel)Download FISCAL FACT No. 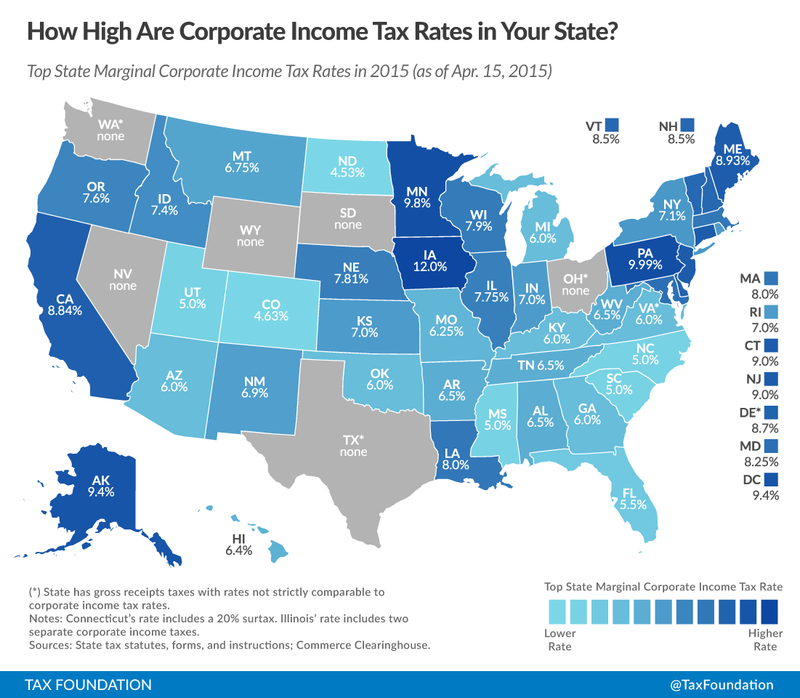 463: State Corporate Income Tax Rates and Brackets for 2015 (PDF)Levied in 44 states, corporate income taxes account for a relatively small share of state revenue—5.2 percent of state tax collections and just over 2 percent of all state revenue, including federal transfers. Top rates range from a low of 4.53 percent in North Dakota to a high of 12 percent in Iowa. Iowa’s highest top corporate tax rate is followed by Pennsylvania’s, at 9.99 percent. Four states and the District of Columbia levy single-rate corporate taxes of 9 percent or more: Minnesota (9.84 percent), Alaska (9.4 percent), the District of Columbia (9.4 percent), Connecticut (9 percent), and New Jersey (9 percent). At the other end of the spectrum, six states have top rates at or below 5 percent: North Dakota at 4.53 percent, Colorado at 4.63 percent, and Mississippi, North Carolina, South Carolina, and Utah all at 5.0 percent. Ohio, Texas, and Washington forego corporate income taxes but instead impose gross receipts taxes on businesses. Nevada, South Dakota, and Wyoming levy neither corporate income nor gross receipts taxes. a tax reform package in the District of Columbia that, among other things, reduced business taxes from 9.975 to 9.4 percent, with planned future reductions designed to bring the rate to 8.25 percent. The following table includes the most up-to-date data available on state corporate income tax rates and brackets. U.S. Census Bureau, State & Local Government Finance, Fiscal Year 2012, http://www.census.gov/govs/local/. Tony Malandra, Huge Tax-Reduction Bill Passes Legislature, Signed by Governor, NFIB, Feb. 22, 2011, http://www.nfib.com/article/huge-tax-reduction-bill-passes-legislature-signed-by-governor-56064/. Illinois Department of Revenue, Illinois Income Tax Rate Decrease, Illinois DOR Informational Bulletin, Jan. 2015, http://www.revenue.state.il.us/Publications/Bulletins/2015/FY-2015-09.pdf. Liz Malm, New Mexico’s Lawmakers Compromise to Pass Corporate Tax Cut Reduction Package, Tax Foundation Tax Policy Blog, Mar. 20, 2013, https://taxfoundation.org/blog/new-mexicos-lawmakers-compromise-pass-corporate-tax-cut-reduction-package. Deloitte, Rhode Island Enacts Significant Tax Reforms, Multistate Tax External Alert, June 25, 2014, http://www2.deloitte.com/content/dam/Deloitte/us/Documents/Tax/us-tax-mts-alert-rhode-island-tax-reforms-062514.pdf. 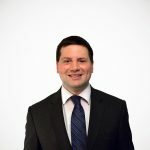 Joseph Henchman, D.C. Council to Vote on Tax Reform Package Today, June 24, 2014, Tax Foundation Tax Policy Blog, https://taxfoundation.org/blog/dc-council-vote-tax-reform-package-today.